Let me begin by apologizing, because this will be less a review and more an all-out rave. After all, with the incredible collection of bloggers that have already covered The Passage, I'm not sure I have too much more to add, at least not anything too original. So what proceeds will be pure gushing, followed by some commentary on other reviews floating around out there. Put simply, this book is astounding. It is glorious, brilliant, wonderful, a joy, a pleasure, a feat. The 800-page tome stemmed from Cronin's daughter's suggestion that he "write a book about a girl who saves the world." And, in a roundabout way, that's what this is: Amy, a six-year-old girl with virtually no ties to the world, is injected with an advanced form of a virus that makes her somewhat super-human. When the test subjects for the earlier form of the virus escape from a military compound, bringing down most of humanity with them, Amy is left utterly alone in a post-apocalyptic world in which "virals" roam the land, killing off the population and leaving the United States an empty shell of what it once was. Worried that I said too much? Don't. That summary is about the first 50 pages. Maybe 100. So there's plenty more to come. Cronin's imagination must be the size of the Milky Way; he has a stunning ability to look at the world around him - the war against terror, the existing highway system, our dependence on vehicles and foreign oil, the mass populations in cities, the power of the military - and see what could be. In this manner, The Passage is terrifyingly real; more than real, it is relevant. Charles Taylor, reviewing the book on the B&N blog, argues that Cronin's book is a service: "He's working for the reader, he wants to immerse whoever picks up the book and, to quote from Stephen King's advance praise, to make the ordinary world disappear." To me, that's just what he did. My ordinary world was taken up by Cronin's prose, and now I want to sleep with the lights on. I'm afraid to walk home from the subway at night. Last night, after finishing the novel, my roommate and I heard a weird noise in the kitchen - and proceeded to huddle together to see what was moving out there. It was the cat. Yes, we were that freaked out. Ron Charles, at The Washington Post, calls it "a macabre pleasure to see what a really talented novelist can do with these old Transylvanian tropes" - and he's not wrong. Sure, it's a "vampire novel." But to call it such is to lump it in with the world of Twilight, True Blood and even Dracula, and The Passage is So. Much. More. Than. That. Blogger Rachel on Home Between the Pages called the book "totally uncategorizable." She hit the nail on the head. It offers, all in one lump 800-page clunker, a mystery, adventure, horror, thriller, sci-fi, fantasy, post-apocalyptic, futuristic, romance, action, and so much more. Not everyone loved it, though. Diane at Bibliophile by the Sea couldn't finish it, and Caitlin at Chaotic Compendiums found it disjointed and far too long. I would disagree (in case you couldn't already guess that) - yes, the book is long and a bit daunting, but it sweeps you up, carries you along in a forceful current of events that require attention and puzzling out and mulling over. And yes, the first half is beautifully done, with character and world development happening seamlessly, and by default, it gets more complicated after the world has been established and the plot takes over the wheel. And yes, the book is somewhat disjointed, in that it carries within it multiple stories, characters and over 100 years of history - but isn't that, to an extent, what an epic does? Bottom line: I'm still just gushing. I found this worth the 3 lbs it added to my bag (for the two days it took me to finish), worth the 2 solid days of reading I gave it (I devoured it). Forgiving a few cliche cliffhanger chapter endings, the writing was strong and original. For the first in a trilogy, the book is startling satisfying - tying up enough loose ends to leave the reader content to re-trace the storyline and try to puzzle out what has happened - and yet enough questions go unanswered to provide a solid set-up for the next books in the trilogy. I am literally sitting on the edge of my seat thinking about the next two in the trilogy. Write faster, Mr. Cronin, write faster. What about you? Thoughts? Have you read it? Will you read it? Are you put off by the hype (I was, but I'm glad I got over it), or the vampire element (don't be)? Note: Thank you to Random House for sending me an ARC to review. Thanks for your enthusiastic review Kerry--I was afraid I was too gushing myself, but I concur! Hap - Get a good sit-down, immediately. It will rock your world. Andi - I had the same problem yesterday! I couldn't have done a third day at my desk without finishing it. Lisa - I enjoyed your review, didn't find it too gushing at all. I find it hard to remain unbiased when reviewing a book I like this much. I want to fist pump this review :) Seriously, I'm so happy you loved it as much as I did. I just got the hardcover in the mail that I ordered to go along with the destroyed ARC I already had because I want to read it again! Like right now :) Thanks for the shout out! Rachel - My ARC fell apart too! I wonder if it's because it's just so dense that the binding couldn't hold together? I'll definitely be purchasing in hardcover, though. Great review! 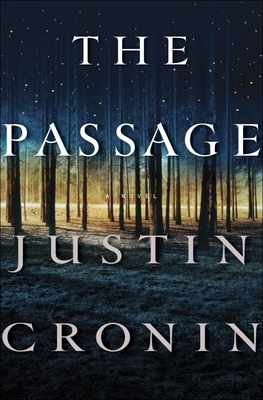 I loved The Passage too! All the reviews I read before I purchased it had me convinced I would like it, but I'll admit that the hype did make me a little nervous that it might not be as good as I was hoping. I'm pleased it lived up to the hype! I love a good apocalypse, and this book is now right up there on the top of my list! A new spin on vampires that makes them a lot more scary and a lot less sparkly, great description, story line and characters. I can't wait to read the rest!